Research Electronics International is pleased to announce the ANDRE™ Advanced Near-field Detection Receiver, a hand-held broadband receiver that detects and assists in locating nearby RF, infrared, visible light, carrier current and other types of transmitters. The ANDRE detects signal activity in its vicinity and displays changes in signal strength over time, allowing users to quickly locate the source of transmissions. The ANDRE’s frequency counter provides quick frequency information of the strongest signal and outputs additional information to an automatic signal list generator. 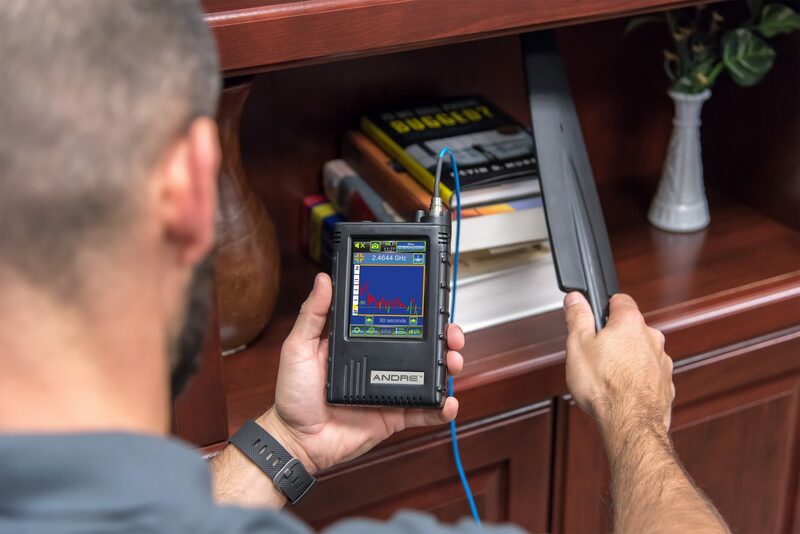 Antenna probes included with the ANDRE can be used to sweep rooms and objects in search for known, unknown, illegal, disruptive, or interfering transmitters from 10 kHz to 6 GHz. A 3.5-inch touch screen displays all of the operation controls and frequency activity. The frequency chart provides advantages over other RF detectors by showing rising and falling signal strength over time. Eight displayed time intervals can be selected ranging from 5 seconds to 24 hours. This helps identify pulsing signals and shows historical peaks, to ensure nothing will be missed. Manual and automatic threshold settings notify the user when a signal exceeds defined strength levels with haptic, audible, and visual alerts. The ANDRE automatically recognizes connected probes and displays the appropriate frequency band on the time chart. When there are no probes attached, the ANDRE’s built-in visible light/IR probe is active. The ANDRE also has a built-in AM audio demodulator that allows users to listen to signals. Ten second audio clips can be recorded for reporting. A built-in frequency counter registers the strongest signal and displays the frequency. Output from the frequency counter can automatically generate a signal list with additional details such as received signal strength, attenuation and gain settings, and information about the communication band classification. Band identification will help classify detected signals based on the FCC frequency allocation the signal falls within. As the signal list builds, stronger signals rise to the top of the list and weaker signals fall within the list. The signal list displays the frequency, date/time and the option to designate the signal as Friendly; Threat; or Unknown. The ANDRE also has the option to capture and store screen shots of any of the screens and audio files. A USB port and cable provides the means for transferring files and recharging batteries in the unit. Access to eavesdropping and electronic bugging devices is becoming easier and more affordable. Broadband receivers, like the ANDRE, provide mobile RF search capability to help locate these and other transmitters quickly and discretely. to acquire quick, non-alerting RF detection and location. performing site surveys, installing and maintaining RF systems, and emissions detection of illicit transmitters. The ANDRE replaces the discontinued CPM-700 Broadband detector. REI will continue to support the CPM-700 with parts and service as long as parts supplies last. This is an excerpt from REI’s Quarterly Newsletter. Click here to download the full edition.